Solitaire Epic is a free solitaire card game. This premium qualitygame is designed to deliver the best solitaire experience, focusingon keeping things simple, clean and easy to play. 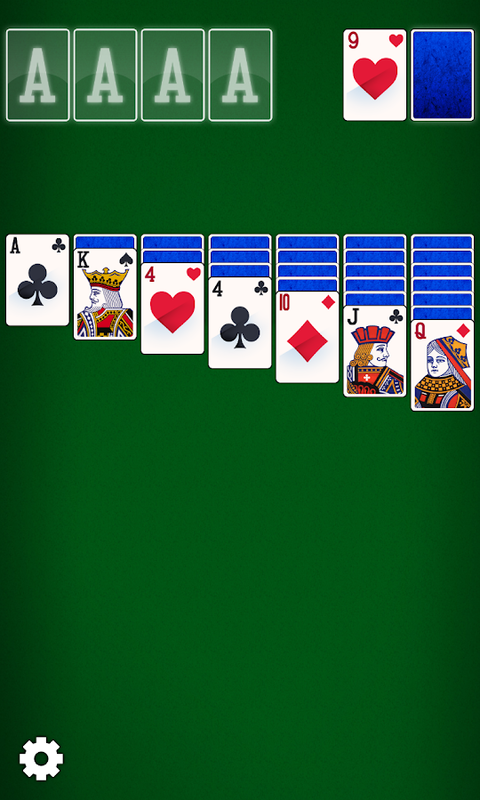 ClassicSolitaire, also known as Patience or Klondike, is the most popularcard game in the world. The simple rules mean that anyone can enjoya relaxing round of Solitaire Epic. Features: • Many options,including Draw 1, Draw 3, undo and hint. • Play both regular games,and guaranteed winnable games. • High quality card sets andbackgrounds. • New daily and monthly challenges. • Standard scoringand Vegas scoring. • Play in both portrait and landscape mode. •Simple and responsive gameplay. • Detailed game statistics. •Complete fun achievements. • And more! Patience, like WindowsSolitaire is the classic card game you know and love. Enjoy clearHD graphics, and exciting ways to play like cumulative vegasscoring where you challenge the house over multiple games. Mahjong Epic has been enjoyed by millions of people for more thanseven years. This free Mahjong sequel improves on the traditionalMahjongg game and brings it to all new heights! Because of itssimple rules and engaging game play, Mahjong Solitaire has becomeone of the most popular board games in the world. Whether you onlyhave a few minutes to spend, or many hours, Mahjong Solitaire Epicis your perfect companion! This free, fun solitaire Mahjong game isalso known as Mahjongg Trails, Shanghai Mah Jong, Chinese Mah-jong,Mahjong Titan, Top Mahjong, Majong, Kyodai. All with the classicmatching game play where you match identical pairs of free Mahjongtiles. Features: - More than 1600 boards! - Get new puzzles daily!- 30 Beautiful backgrounds! - 8 Unique tile sets! - Relaxing, zengame play. - Simple pick-up-and-play controls. - Completechallenging goals! - 1080p HD Graphics! - And more! Playing Mahjongis very simple: find and match pairs of identical tiles. Match alltiles to complete a board. Jigsaw Puzzles Epic is a jigsaw game with over 10,000 beautifulpictures in a wide variety of categories. You can also createpuzzles from your own photos. This premium quality app is theperfect choice for lovers of jig saw puzzles. In Jigsaw Puzzle Epicyou can travel all around the globe, see majestic landscapes,experience the seasons of the year and the wonders of the world,all from the peace and quiet of your own home. Features: • Over10,000 beautiful, HD photographs, in more than 250 different packs!• Get a new free puzzle daily! • New puzzle packs added regularly!• 11 difficulty settings: Up to 625 pieces! • Create custom puzzlesfrom your own photo collection. • Every puzzle is unique: Differentpiece shapes every time! • Saves all puzzles in progress, so youcan work on several at the same time. • Complete challenging goals!• 1080p HD Graphics. Mahjong Titan is a free mahjong matching game. This premium qualitygame is your perfect match for playing some relaxing Mahjong.Mahjong Solitaire is one of the most popular board games in theworld. The simple rules and relaxing game play means that anyonecan enjoy a round of Mahjong Titan. This free board game is alsoknown as Mah Jong, Majong and Top Mahjong. In Mahjong SolitaireTitan you match pairs of identical Mahjongg tiles. Features: • Over1600 boards! • A new free Mahjong board every day! • 8 large, highquality tile sets. • 12 backgrounds. • Optimized for portrait mode.• Fun goals to master. • 1080p HD Graphics. Sudoku Epic is a free sudoku game with five different sudoku gamesin one: Regular 9x9 puzzles, 6x6 mini, Wordoku (also known asLetter Sudoku), Killer Sudoku and daily soduko challenges. KillerSudoku is an exciting mix of sodoku and kakuro. Wordoku is playedwith letters instead of numbers, and the puzzles contain words thatfunction as hints. With thousands of puzzles and challenging goals,Sudoku Epic is the perfect app for exercising your brain! Features:• Five Sudoku game modes! • Thousands of free sudoku puzzles! •Killer Suduko: For expert puzzle solvers! • Wordoku: Find thehidden word! • Get new puzzles daily! • Auto notes • Completegoals! • Five difficulty settings! • Get hints! Word Search Epic lets you enjoy free, unlimited puzzles in avariety of different categories. Find the hidden words to solve thepuzzle. Play handcrafted puzzles, or generate new random ones forlimitless, free play! One of the top word games with some of thebest options like design your own custom games, different sizes anddifficulty settings plus a huge selection of categories for allyour word seeking needs! Features: • Generate new puzzles forunlimited play! • More than 70 categories! • Hundreds of free wordsearch levels! • Large or small puzzles with 4 difficulties. • Newdaily challenges. • Complete fun goals. • 1080p HD Graphics. Cooking Chef Solitaire is base on Tripeaks Solitaire. Challengeawaits you in this magical Solitaire game. Find gold card, help thechef to collect ingredients, cooking delicious food, by Tappingcards from the board that is one lower or one higher than the cardin the base pile. Cooking Chef Solitaire is completely free to playbut some in-game item such as jokers will require payment. You area Junior chef now, solve puzzles and become a Super chef. GameFeatures: - Chef Cooking type of game - Free to play - 3D cards& Effect - Big and easy to see card - Offline play -Multi-Language supported With all the great features, you will loveour Cooking Chef Solitaire! Play it now and enjoy! TriPeaks Solitaire is a brand new card game experience, filled withfun casino style logic puzzles . Our TriPeaks Solitaire game givesyou unlimited and unrestricted card games, so you can play to yourheart’s content…no more waiting for the next TriPeaks level tounlock! Solitaire fans and cards games fans will fall in love withthis new TriPeaks Solitaire experience! TriPeaks Solitaire is base on classic solitaire. We create some newfeatures to make TriPeaks solitaire more fun. You can enjoy thisfree game for a long time because there are 500+ levels and withnew levels to join in. Puzzle challenge levels and celebrate yourvictory. Our TriPeaks solitaire gives you totally new and cool gameexperience. Cards that placed on the board is tower-shaped, theuppers cards are tappable. The goal of the game is to collect goldcard by tapping cards from the cards tower that is lower or onehigher than the one in the base. Our game is free to download butsome in-app items need your pay, When some items are bought, thisgame will be ad free. We are glad to see this game to be installedand we value your comments very much. Classic solitaire and cardsgame fans will fall in love this TriPeaks game. Game Features: 1.Classic card game in a nice Fantasy Theme 2. Keys and locks 3. Easyto play, yet hard to be master 4. Lucky cards to Enjoy. 5. Feedfishes to earn coins 6. You can play offline - no Wifi needed 7. HDGraphics Download TriPeaks solitaire for free and Enjoy it now! Farm Solitaire is base on TriPeaks Solitaire. We create some newfeatures to make farm solitaire more fun. You can enjoy for a longtime because there are 350+ levels and with new levels to join in.Puzzle challenge levels and celebrate your TriPeaks victory. OurFarm Solitaire gives you totally new and cool game experience. Thegoal of the game is to collect gold card by tapping cards from theboard that is lower or one higher than the one in the base.TriPeaks Solitaire and cards game fans will fall in love this game.Game Features: # 3D mahjong style card! # Keys and locks # Luckycards to Enjoy. # Feed animals on the farm # Easy to play andsimple to use Download Farm Solitaire for free and Enjoy it now! TriPeaks Solitaire:Forest Fairy is a brand new card gameexperience, filled with fun TriPeaks style logic puzzles. Braintraining and puzzle fun meet in this free game! Solve deals andcelebrate your TriPeaks Solitaire victory with our exclusive fairywinning animations at the end of every deal. To remove one card,its value must follow the one that exists at the bottom. If youhave a King at the bottom, you will be able to remove any aces orQueens present in the respective towers. Once you remove a card, itwill replace the one found at the bottom, making all your choicesthe more strategic. Solitaire fans and cards games fans will fallin love with this new TriPeaks Solitaire:Forest Fairy experience!Solitaire Game features: - 3D cards & 3D Effects. - Free toPlay & Offline Play - Beautiful design - User-friendlyinterface - Undo feature. - Classic Design. - Locks & KeysDownload this TriPeaks Solitaire:Forest Fairy right now, You willlove it!